In August of 2016, Australia will have the pleasure of being in the company of someone who can be said to have truly, literally changed the world. Among the many accomplishments for which Steve “Woz” Wozniak is renowned, two stand out above the rest: the inventor of the personal computer, and – along with Steve Jobs – the co-founder of Apple. Woz’s inventions have been as innovative as the path along which he has travelled to reach his destination. 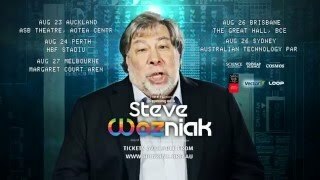 Despite a net worth of US$100 million, hubris has not stood in the way of humility for Woz as he consistently values a good old-fashioned work ethic of pleasure over profit. No stranger to moonlighting (developing the PC on his nights while working at HP), Woz is also a well-renowned philanthropist, a motivational speaker (without the woo­woo), and, importantly, a strong champion for STEM education.